At Implementation > Controlling > Report/Review Schedule, you can manage the project’s reporting settings: levels like Interim and Periodic, periods, schedule and each report’s due date. Please note that in order to access this page, you need Coordinator Rights. It is mandatory to define the reporting schedule before starting the implementation phase. With the due date of a report, you can set which report shall be selected as default behind the reporting menu. By default, EMDESK will select and open the report with the next up-coming due date for current preparation in the reporting section. Basically, any partner can report information at any time during the reporting period and should finalize it before the report is due. Once the due date has passed, EMDESK will automatically close the reporting period and open the reporting period with the next up-coming due date. However, every user can always reopen previous reports manually. By postponing a report’s due date, you can allow some additional time for reporting. If enabled by the user’s notification settings, the system sends out reminder mails to the responsible users about an Interim or Periodic report with an up-coming due date, unless all required sections in Implementation > Reporting are finalized. Responsible users are assigned to a contractor that is involved by plan resources or is a leader. Please note that you can set due dates of reports only. If you want to change the amount and periods of interim or periodic reports, please contact the technical support. Note that Interim Reports must be consistent and follow each other without any gaps because all information – except work progress description (at Implementation > Reporting > Progress) which is also recorded at the level of Periodic Reports – are recorded at the level of Interim Reports. For example, partner report actual person-months for the Interim Report M1-M6, but when generating the resource table for the Periodic Report, the system additionally requires the remaining actual person-month for the Interim Report M7-M12 in order to aggregate the person-months for the period M1-M12. At Implementation > Reporting > Resources, users report their actual effort consumption – by default – per each Interim Reports. 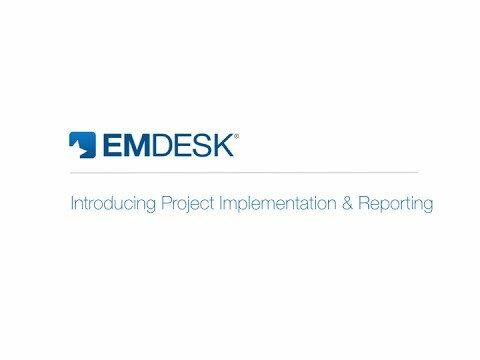 EMDESK allows the configuration of individual Resource Reports (Period for Resource Recording) in order to collect person-month at intermediate periods. If Resource Reports are set, those periods are used to record resources. To create individual Resource Reports, please click at the button Copy Interim Reports in the panel Resource Reports (Period for Resource Recording). EMDESK will create a schedule of Resource Reports equal to Interim Reports. Then you will able to adapt the schedule by changing the period covers, deleting a report or adding further periods. Please note that previously recorded person-month at the level of Interim Reports are copied to the new Resource Reports and do not get lost.